15th May 2013 – Overthrow Digital triumphed at the Arts and Business Awards last night at the London Symphony Orchestra’s St Luke’s Centre. The awards honour the most successful partnerships from around the UK by profiling best practice, innovation, thought-leadership, and ground-breaking brand enhancement. Overthrow Digital’s collaboration with Photobox and The Princes Foundation for Children and the Arts for the Face Britain website was honoured when they won the Arts and Business Digital Partnership Award. Face Britain is an imaginative and inspiring mass collaborative arts initiative, which engaged over 200,000 children with the arts nationwide. 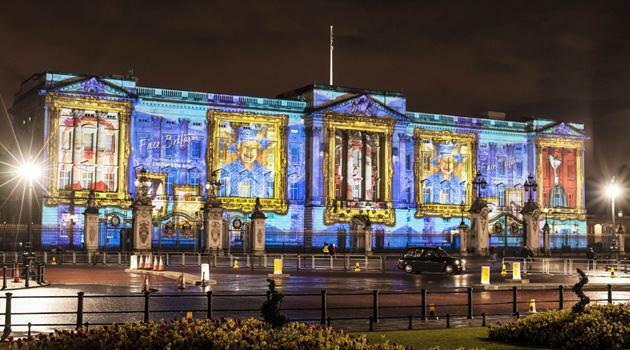 The record-breaking project culminated in a unique portrait projection of HM The Queen onto Buckingham Palace, formed out of all the participants’ portraits. Through partnering with The Prince’s Foundation for Children & the Arts and Photobox to deliver Face Britain, Overthrow Digital positioned themselves at the cutting edge of creativity. Their work vastly extended the reach of the project across multiple platforms and brought Face Britain to life. The project even broke a Guinness World Record for ‘Most Artists working on the same art installation’. Overthrow Digital also produced the animated videos used on the site, the eBay auction shop, newsletter design, various digital promotional items and the artwork and technology for the JC Decaux digital billboards and BBC big screen. Overthrow Digital design and build creative websites for a range of organizations. The websites they develop are supported with targeted online marketing strategies including search engine optimization, social media, email marketing and online advertising. To see more of their portfolio that demonstrates the wide range of web design and digital projects visit www.overthrowdigital.com.